I have never gone fishing in my life, but it is something I plan to do before I die. However, I won’t spend a whole article talking about my desire for fishing. 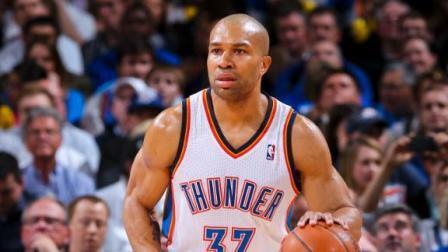 Rather it will focus on the effect the Derek Fisher trade will have on the Lakers. The Lakers sorely needed an upgrade at the point guard position and they finally got it by acquiring Ramon Sessions for Luke Walton and some other players. This was exciting news until I found out the second trade that was made; Derek Fisher was no longer a Laker. Confused and depressed, I can honestly say I sat on my couch for at least 20 minutes trying to wrap my head around the idea of not seeing Fish’ in the Purple and Gold. This had to be one of the worst moves that Mitch orchestrated in recent memory. Obviously, at 37 years old Fisher wasn’t going to produce like other starting point guards in the league. However, his importance to this Laker team stretches further than on-court production. Throughout his 13 years as a Laker he has proven time and time again that he is someone the team needs when it matters; especially in recent playoff runs. Before his first three year stint away from the Lakers he proved a vital role in the Lakers 3-peat from 2000-2002. 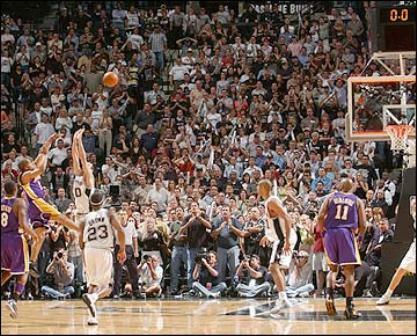 He even hit multiple clutch shots that would help the Lakers go far; his most memorable shot being in 2004 against San Antonio in the second round of the playoffs. Tim Duncan makes an incredible shot at the top of the key over Shaq, and all hope looks lost for the Lakers seeing as there was less than half a second left on the clock. When the play was in motion, everyone and their mother knew the ball was going for Bryant. The Spurs then doubled Bryant so he wouldn’t get the ball. This led Fisher to be wide open for a catch and release to win the game! 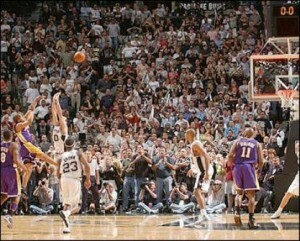 The shot should have been impossible since there was only 0.4 seconds left, but somehow Fisher pulled it off. During the dark years (2004-2007), Fisher left the team and the Lakers had trouble even making it to the playoffs. Kobe Bryant eventually blew up and demanded he be traded if the team didn’t make the right moves to win a championship. Derek Fisher was signed as a free agent before the 2007-2008 season and many would fail to realize how important this move was; especially to quell Bryant’s trade demands. Kobe and Derek entered the league together in 1996, so they became quick pals in the league. Throughout the years, and even to this day, Kobe admits that Fisher is the player he respects and trusts the most as a team mate. When Fisher came back that year it signaled the revival of the Lakers. The Lakers slowly got better and with the trade that got them Pau Gasol, catapulted them to contender status. 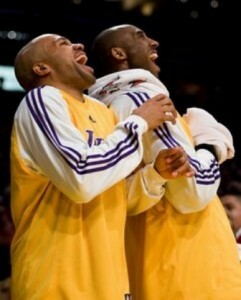 The Lakers would be considered contenders every year since Fisher came back and they legitimately were. Fisher provided off-court leadership that would contrast that of Bryant’s harshness. The chemistry and other factors that Fisher provided went far beyond points scored. Without Fisher I honestly believe the Lakers would have lost game 3 of the 2010 Finals and eventually it could have cost them the series. He may not be a presence during the regular season but he doesn’t need to be. That’s what he had Kobe, Pau, Andrew and the other players on the team for. His real value came in the playoffs. His leadership and experience was invaluable to a team seeking to catch Boston in the overall championship count. Derek Fisher really should have remained a Laker until he retired; and in my eyes, he should have his jersey retired. However the jerseys the Lakers retired are reserved for the elite; this means the likes of Kobe, Magic, Kareem, and Worthy. Though if he played for the Celtics he would have definitely had his jersey retired. His presence within the Lakers won’t truly be felt until playoff time. Fisher is the type of player that just has certain qualities about him that make him one of the more liked players in the league. I truly wish him the best with the Thunder now and am looking forward to his homecoming this Thursday.